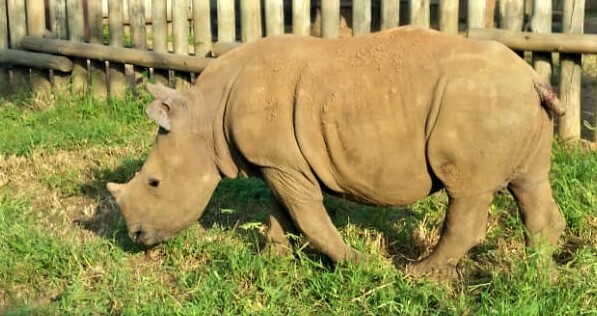 On the evening of the 14th February 2019, Care for Wild Rhino Sanctuary was notified about a calf that had been orphaned the previous night (13th February 2019) on a private game reserve adjacent to the Kruger National Park. Three rhino cows were poached at a waterhole, one of which had a young male calf at her side. The young rhino bull was located around 4pm on the 14th February 2019 and seen to have been injured by hyenas. Due to the size of the calf, a helicopter was not going to be able to transport the calf to safety. The rescue team needed to devise another plan while the rangers kept an eye on the orphaned rhino. A trailer was made available and sent to the location. Having gotten lost in the unforgiving bush, the trailer eventually arrived at the calf around 8:30pm. Veterinarian Dr. Joel Alves, from Wildlifevets.com, darted the young calf and rescued him from the bush. The calf was placed on a drip and basic wound care was given. The calf was loaded onto the trailer and begun its journey to safety. Unfortunately, due to the harsh nature of the bush, the trailer suffered damage to the tyre, rendering it unsafe to continue. Being the middle of the night, the team had very few options. Fortunately, a bakkie (pick up truck) with a canopy was made available to assist in the rescue of the orphaned calf. This less-than-ideal option was the only option the team had, and the life of the orphaned calf was at stake. The rescue team moved the injured calf across into the back of the canopied vehicle. Cushions and blankets from the nearby camp were used to make the environment of the calf being moved as comfortable as possible. The team finally made their way to Care for Wild Rhino Sanctuary where they arrived at 02:54am in the morning. Upon arrival, the calf was moved from the vehicle into the baby rhino crate at the Intensive Care Unit. The orphan’s wounds were cleaned and treatment begun with medical grade Manuka honey. The calf’s vital signs were monitored as his blood glucose levels on arrival were very low. The orphaned rhino began learning to drink from a bottle just a few hours after his arrival, and by the next day he was drinking his milk well. Lazuli, as he is now named, has a very special meaning. Lazuli means royalty and honor, gods and power, spirit and vision. Having survived being viciously attacked and wounded by hyenas, Lazuli’s wounds needed to be treated thoroughly. On the 19th February 2019, Dr. Ferreira du Plessis from the Mpumalanga Tourism and Parks Agency, as well as Dr. Albertus Coetzee from West Acres Animal Hospital sedated Lazuli and tended to his wounds surgically. The Care for Wild Rhino Sanctuary team continues to monitor Lazuli’s progress and we are happy to report that his condition continues to improve. On the 21st February 2019, Lazuli was introduced to baby Ribbon for the first time. The moment was simply magical. The two orphans nuzzled each other, and became the friends they have been waiting for, in an instance! We are happy to report that the two orphaned rhinos have since been moved out of the ICU and now spend their days playing, napping and eating together in one of the larger bomas at the main holding facility. We would like to say a huge THANK YOU to EVERYONE involved in the rescue of this special young rhino. From the rangers that kept him safe until help arrived, to the veterinarians and members involved in his rescue and wound treatments. With your dedication and passion, Lazuli has a future as a rhino bull in the bush.